Evidence that Neptune has one or more rings arose in the mid-1980s when stellar occultation studies from Earth occasionally showed a brief dip in the star's brightness just before or after the planet passed in front of it. Because dips were seen only in some studies and never symmetrically on both sides of the planet, scientists concluded that any rings present do not completely encircle Neptune but instead have the form of partial rings, or ring arcs. Egalité 2, and Fraternité. They range in length from about 1,000 km (600 miles) to more than 10,000 km (6,000 miles). Although the moon Galatea, which orbits just planetward of the inner edge of Adams, may gravitationally interact with the ring to trap ring particles temporarily in such arclike regions, collisions between ring particles should eventually spread the constituent material relatively uniformly around the ring. Consequently, it is suspected that the event that supplied the material for Adams's enigmatic arcs—perhaps the breakup of a small moon—occurred within the past few thousand years. The other five known rings of Neptune—Galle, Le Verrier, Lassell, Arago, and Galatea, in order of increasing distance from the planet—lack the nonuniformity in density exhibited by Adams. Le Verrier, which is about 110 km (70 miles) in radial width, closely resembles the nonarc regions of Adams. Similar to the relationship between the moon Galatea and the ring Adams, the moon Despina orbits Neptune just planetward of the ring Le Verrier. Each moon may gravitationally repel particles near the inner edge of its respective ring, acting as a shepherd moon to keep ring material from spreading inward. material that extends outward from Le Verrier about halfway to Adams. Arago is the name used to distinguish a narrow, relatively bright region at the outer edge of Lassell. Galatea is the name generally used to refer to a faint ring of material spread all along the orbit of the moon Galatea. 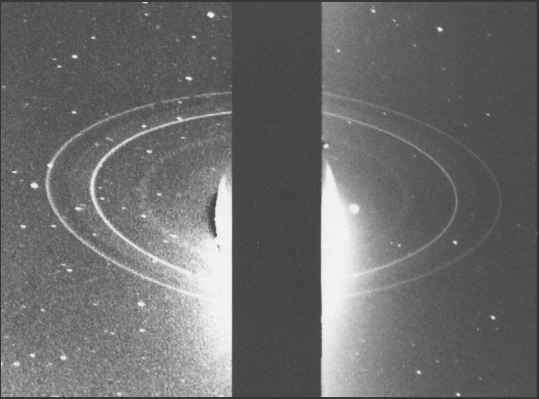 None of Neptune's rings were detected from scattering effects on Voyager's radio signal propagating through the rings, which indicates that they are nearly devoid of particles in the centimetre size range or larger. The fact that the rings were most visible in Voyager images when backlit by sunlight implies that they are largely populated by dust-sized particles, which scatter light forward much better than back toward the Sun and Earth. Their chemical makeup is not known, but, like the rings of Uranus, the surfaces of Neptune's ring particles (and possibly the particles in their entirety) may be composed of radiation-darkened methane ices. The suspected youthfulness of Adams's ring arcs and the arguments offered can be extended to Neptune's rings in general. The present rings are narrow, and scientists have found it difficult to explain how the orbits of the known moons can effectively confine the natural radial spreading of the rings. This has led many to speculate that Neptune's present rings may be much younger than the planet itself, perhaps substantially less than a million years. 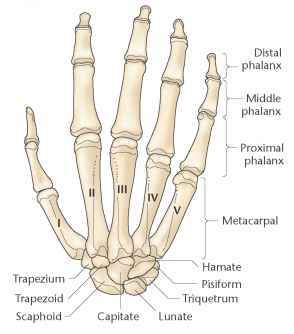 The present ring system may be markedly different from any that existed a million years ago. It is even possible that the next spacecraft to visit Neptune's rings will find a system greatly evolved from the one Voyager 2 imaged in 1989.